Labor Day South Carolina Waterfalls - Take a Hike! For the Labor Day long weekend, Sandy and I headed to South Carolina to get some waterfalls so she could finish up the WC100 challenge. We left Friday at 4 AM to get an early start, crossing into South Carolina right around sunrise. We continued on I-85 to Greenville, then headed to Westminster on US-123. In Westminster, we got on US-76 and then turned on Cobb Bridge Road. We then got on the gravel FSR 748 and drove about 2 miles to FSR 748C. Sandy was feeling brave and we drove down this extremely narrow gravel road with many mounds. It was an interesting drive, but thankfully quite short. We parked at the end and then started our first hike of the weekend to Riley Moore Falls. It’s about 1.5 miles round trip and moderate to the falls. At the end of the trail, we scrambled down to the sandy beach along the river for some pictures of the waterfall. The last time I was here, the water level was much higher and so this and all the waterfalls we would see were much more powerful then. For Riley Moore Falls, however, I thought the waterfall actually looked better in low water conditions. Although the waterfall is the width of the entire river, it’s only about 12 feet high. In high water conditions, it looks more like a big rapid, but today it looked more like a waterfall. We got some pictures from the beach then climbed up to get some pictures from the side, then started hiking back. Although the weather was dry, we saw a lot of colorful mushrooms and other fungi along our hikes this weekend. Back at the car, we made the white-knuckle drive back up and then got back on US-76 towards Long Creek. We got on Turkey Ridge Road (FSR 755) and drove about 3 miles to the turnaround at the end of the road. From here, we began hiking down FSR 755I for about a half-mile to the end of this road. Along the way, we some some interesting flower that had opened up to reveal bright red berries. Near the end of the gravel road, there were some downed trees and we inadvertently got off the trail and had to bushwhack a short ways. 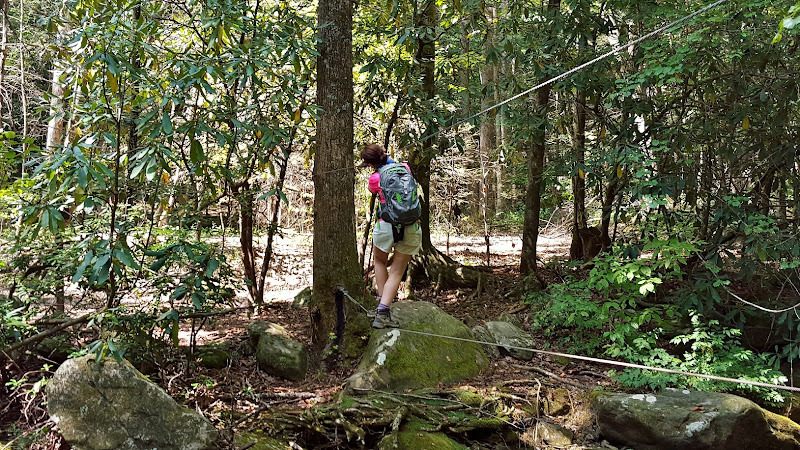 Soon, we found the trail again and continued hiking along a ridgeline above Chattooga River. In about 1.5 miles from the start, a bunch of branches and sticks blocking the trail indicated the end so we turned left to head down to river level, right where Long Creek flows into Chattooga River. Across the creek, some whitewater rafters had stopped for a break at this waterfall. We ate lunch here and then I took off my boots and waded across the creek and headed up to the base of the waterfall. It was hot enough that the cold water felt very good. The water level was low, so I was able to climb up the rocks near the base of the waterfall. As we were getting ready to head back, I saw a beautiful tiger swallowtail butterfly on some of the flowers blooming here. After a couple pictures, we made our way back to the car. We then drove back on FSR-755 for less than a mile to the trailhead for Opossum Creek Falls. The trail heads through a forested area towards Chattooga River. About half way down the trail, I heard something moving in the brushes. As I got closer, I startled it and it started to run. It was big, so I thought it was a deer, but I got a quick glance and it was big and black with a brown muzzle – a black bear. He quickly made his way into some dense rhododendron, so no way to take a picture. We decided it would be best to talk loudly as we hiked to ensure we didn’t startle another bear. Once at the river, we turned left to head upstream along Opossum Creek to the waterfall. It’s a pretty waterfall, but the water level was low and there was a lot of downed trees and foliage blocking the view. After some pictures, we started to make our way back. At Chattooga River, we rock-hopped across the beach and went out to the sandy beach in river. We didn't see any rafters, but the river was pretty. Then we started heading back up. It was hot and humid and the entire hike back is uphill, so it was a bit of a grueling hike. No more bears along the way, though. Once back at the car, we headed back to US-76 towards Westminster and turned on Brasstown Road. In 4 miles, we turned right on FSR-751 and drove to the parking area at the end. It’s a short hike, but you sure get a lot of bang for the buck on this one. 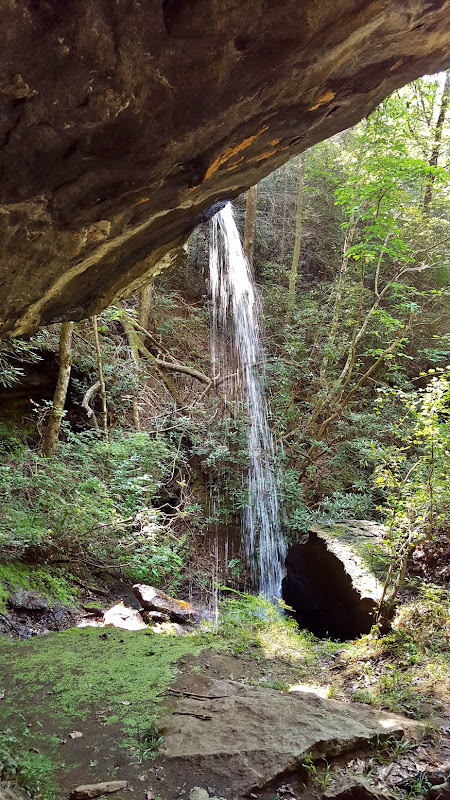 In a quarter-mile, the trail comes to Brasstown Creek at the top of the waterfall. We hiked a short ways downstream to see the upper section, about 50 feet of cascades. Looking downstream, we could see the edge of the middle section. We continued down and came out at the base of the middle section, a 20-foot veil over a ledge and probably the most scenic section of the waterfall. We also climbed out on some rocks to get a view of this section from further away. It's the nicest section of the waterfall in my opinion. Then we continued down to the lowest section, a 15-foot chute. There was no way to get a good picture from the rocks, so I waded into the shallow pool to get a picture. Then we started making the climb back up to the top of the waterfall. But we weren’t quite done yet. We continued upstream past a campsite and waded across the creek to Little Brasstown Falls, another pretty 20-foot waterfall where Little Brasstown Creek flows into Brasstown Creek. After a couple pictures, we headed back. Driving back out, we stopped for dinner at Brasstown Creek Gathering Place. I had been here before and think they have some of the best barbeque around and wanted Sandy to try it. After dinner, we headed north to Cherry Hill Recreation Area near Mountain Rest where Justine and the others were camping. We set up our tent and took a quick shower and then went to bed after a very long day. Overnight, there was a heavy rain, but unfortunately, not enough to really help the waterfalls. Saturday morning, we woke up early, had breakfast and departed camp. We headed north for about a mile to Burrell’s Ford Road (FSR-708). In about 2.5 miles, we pulled over at a pull-off and started our first of many hikes for the day. We made the short hike to Spoonauger Falls. Unfortunately, this one is pretty pitiful in the low water, despite the rains the night before. After a couple of quick pictures, we headed back to the car and drove just a short ways back up FSR-708. There’s a large parking area for Burrells Ford campground where we parked. We hiked down the gravel road to the campground and then took the trail towards King Creek Falls. Initially, the trail follows the Foothills Trail to a bridge over King Creek. Across the bridge, the trails split. We went left to follow the trail upstream to King Creek Falls. It’s a beautiful 75-foot waterfall and still looked good even in the low water. We crossed the logs at the base and got some pictures from the sandy beach. There were a lot of nice wildflowers blooming around the base of the waterfall as well as a cairn in the shallow water. We got some pictures here and then started heading back. Back at the car, we got on SC-107 south and past the campground, turned left on Winding Stairs Road, a steep and winding gravel road. At the end, we turned right on Jumping Branch Road and then right on FSR-715A. This turn can be tricky to find as it’s not on most maps or GPS. In about three-quarters of a mile, we pulled into a parking area just before the bridge over Tamassee Creek and got ready for our next hike. Lee Falls is a really beautiful waterfall, but a bit tough to find as there’s no trail. Once we were ready, we started hiking through the field past the gate. The last time I was here, it was raining, but today we had rather nice weather. So it was very pleasant hiking through the fields where wildflowers were in full bloom and a large number of butterflies were fluttering about. We also saw a number of honey bees collecting nectar from the flowers. We also saw some species of Physalis, which produces the most interesting "lanterns" to protect their fruit as it develops. Across the first field, we had to rock hop across the creek and came to the second field. This one has two sections and after the second section, we crossed another creek and came to the third field. The last time I was here, the water level was way up and we had to wade across, but it was low enough today that we could easily rock hop. After this crossing, the path headed into the woods and continued following Tamassee Creek upstream towards the waterfall. We saw a cute little orange toad right along the path through the woods. It’s not too bad until about a mile from the trailhead. We had to cross a small tributary and then continue upstream. There’s not much of a trail at this point and it’s quite steep and rocky; at one point we were in a narrow strip of rocks and dirt in the middle of the creek. There were a couple parts with a rather treacherous scramble up wet rocks, but soon we made it to the base of Lee Falls. Again, the water level was low, but this is still a very nice waterfall. It really reminds of something you might see in a tropical rainforest. We got some pictures here and had a snack then made our way back. From here, we made a short drive to Oconee Station Road and parked at the trailhead for Station Cove Falls. The small parking area was almost full, but we were able to get the last parking space. This is an easy waterfall to get and so quite popular. We hiked along the Palmetto Trail towards Oconee State Park, seeing some pretty coral fungi growing near a footbridge. In about a half-mile, we reached the spur trail to Station Cove Falls. Some brilliantly orange Jack-o-Lantern mushrooms were growing around a tree near the turn. It was a short way on the spur trail to the waterfall. This waterfall looked a little pitiful in the low water and there were a lot of people here, so we didn’t spend too long. Surprisingly, we actually had cell signal here. Back at the car, we continued south to get on SC-28 and headed to Yellow Branch Picnic Area. After parking, we got on Yellow Branch Falls Trail. This is a really pleasant trail, about 1.5 miles to the waterfall through a nice forest and more mushrooms. Yellow Branch Falls was one of my favorite waterfalls in South Carolina. In high water levels, it is absolutely beautiful – it feels like a magical place. But even today, in lower water levels, it was still quite pretty and the setting still had a magical feel. Sandy and I climbed around on the rocks and got pictures of the waterfall from different points. Unfortunately, we didn’t see the cute little salamanders all around the waterfall that I had seen previously. As more people started to arrive, we made our way back. Our last waterfall of the day was just across the street. We pulled into Stumphouse Tunnel and paid at the self-serve kiosk, then parked at Issaqueena Falls. There were a lot of people here. We didn’t bother stopping at the overlook, because the view of the falls is poor. Instead, we scrambled down to the base for a better view. It was so crowded here that we actually had to stand in line to scramble down to the base. Like a few others this weekend, the waterfall was pretty pitiful at such low water levels. I climbed over to the left side where there was the most water flow for a picture of the falls. Then we headed back up and departed. For dinner, we headed into Walhalla and had Mexican at Puerto Nuevo and then started heading back towards camp. Driving north on SC-107, we passed Oconee State Park and saw a sign for waterfalls after that. We had over an hour until sunset, so figured we’d try to get one more in. We turned on left on Village Creek Road and then right on Nicholson Ford Road (FSR-775) and drove about 2 miles to a parking area on the right. We parked here and took the short connector trail to the Foothills Trail then started hiking towards Chattooga River. In about a half-mile or so, we came to another parking area at the end of FSR-775 – apparently we should have driven a little further and parked here. We hiked for another half-mile or so and turned at the sign for Licklog Falls. It was just a small 10-foot cascade that looked like it needed some more water. I did some research later on and realized this was in fact Pigpen Falls, not Licklog Falls. Licklog Falls was just another quarter-mile down the trail. But we were running very short on daylight, so we turned back. At the parking area, we hiked the forest road back to our car as this was quicker than taking the Foothills Trail. We then headed back to camp, took showers, and enjoyed a campfire with our friends who had been in Southern Nantahala Wilderness for the day. Sunday morning, we tried to get an early start as we had a bit of a drive. We headed east, passing Whitewater Falls and getting on SC-11 towards Greenville County. We turned onto US-276 and then headed into Asbury Hills Methodist Camp. Although privately property, the people here are nice enough to allow hikers to access their property when camp is not in session. Sandy had called in advance to get permission and the gate code. We parked near the basketball courts and started hiking up the red-blazed Asbury Trail. Initially, it passes a lake, though it was completely dry. The trail then heads upstream along Matthews Creek. It was clear that not a lot of other people had hiked this trail recently as the spider webs across the trail were awful. Clearing them with hiking poles was only marginally effective. We picked up some downed branches along the side of the trail that were more helpful although I imagine we looked strange waving long branches around as we hiked. In a little over a mile, we came to the cable bridge across Matthews Creek and got on the pink-blazed Naturaland Trust Trail, turning right. We followed this trail until the next split at a cairn and went right on an unofficial trail that looked like an old road. Shortly thereafter, we made another right at a cairn and followed the path to the top of Moonshine Falls. We stopped for a snack in the cave area behind the falls, where old rusty drums and distillation equipment remain. It’s no surprise where Moonshine Falls got its name. I then climbed down to the base for some more pictures. Although the upper part of the falls that flows past the cave was still going well, the lower cascades were almost nonexistent. After some pictures, we climbed back up to the path and continued down the path. There’s not much of a path, but a few pieces of flagging tape helped ensure we were going the right way. We came to some downed trees and got off the path for a bit, then found it again and continued until we got to another mess of downed trees. We went to the right to get around the trees and headed down to creek level, but came out quite a bit downstream of our target. So we had to make a difficult bushwhack upstream to Confusion Falls. Not sure where this waterfall got its name – confusion in trying to find the waterfall or confusion from too much moonshine? Either way, it’s a pretty nice waterfall even with the low water flow. A fallen log split the waterfall where the two streams converge. Then we climbed back up to the second mess of downed trees and followed the path back. Fortunately, on the hike back, most of the spider webs were still cleared from our hike in. From Asbury Hills, we headed west back into Pickens County and took US-178 north to Horse Pasture Road and parked at the Foothills Trail parking area here. We hiked a short ways on the gravel road, then turned left onto Eastatoe Gorge Trail, a spur of the Foothills Trail. The yellow-blazed trail follows an old road along a ridgeline high above Eastatoe Creek. At one point, a tremendous number of yellow flowers were blooming along the trail. At a few points, we could hear the creek far below; perhaps there was a waterfall down there, but it was too steep and overgrown to find out. In about 2 miles, the trail makes a descent into the gorge via a number of switchbacks. I was surprised to see several other groups of people here. I thought this place was pretty much unknown. But they were heading up, so when we reached the gorge, we had it all to ourselves. We turned right at the bottom and went to the small platform overlooking the Narrows. It’s not a huge waterfall, but extremely scenic with the water tumbling down through an extremely narrow gorge. This is another of the few waterfalls that I thought looked better in low water. After a few pictures, we started making our way back. The climb back up was steep, but the switchbacks reduced the slope and we stopped to see some mushrooms growing along the way. After getting up out of the gorge, the rest of the hike back was pretty easy. Once back at the car, we headed south on US-178 and took Cleo Chapman Highway west as we headed to the parking area for Twin Falls off Water Falls Road. Not surprisingly, there were a lot of cars here. The hike is an easy quarter-mile and Twin Falls is a great waterfall. Reedy Cove Creek splits into two streams at the top of waterfall, hence the name. To the left, the water plunges off a 75-foot granite cliff while the right stream tumbles and cascades down and around boulders before the two streams meet up at the bottom. It was dry and the water level was low so we were able to climb around on the rocks and get up close to the waterfall. I had taken my boots off, but hadn't needed to, as there were enough dry surfaces to walk all around with getting wet. The last time I had been here, the water level was way up and there was no way to safely get out on the rocks here. On the hike back, we stopped to see the cute little water wheel along the trail. There was no water, however, so the wheel wasn't turning. After some pictures, we headed back to the car and made our way to Pickens for dinner. We had pizza at Tonys and then headed back to camp. Monday morning, we broke camp, said good-bye to our friends, and then headed east. We went north on SC-107 and cut over to SC-130, stopping at an overlook where we had lovely views of Lake Jocassee in the early morning light. We then took NC-281 and US-64 into Brevard, NC and then followed US-276 back into South Carolina. Right across the state line, we parked at the trailhead for Raven Cliff Falls at Caesars Head State Park. Although it was still fairly early in the morning, the parking lot was already almost full. Raven Cliff Falls is a popular area, especially on a holiday. We ended up getting one of the last parking spaces. After paying the day-use fee, we started hiking the red-blazed Raven Cliff Falls Trail. In about 1.5 miles, we turned right on the blue-blazed Gum Gap Trail and followed this for another mile or so. Due to the greater crowds here, we fortunately didn’t have to deal with the spider webs along the trail - someone else had come through first and cleared them. We did walk through a nice area of rhododendron tunnels and saw more interesting mushrooms along the way, however. At the next split, we turned left on the pink-blazed Naturaland Trust Trail and hiked down to the top of Raven Cliff Falls. Unfortunately, the trail ends after the suspension bridge over the top of the waterfall. I was hoping to be able to get a little closer to the waterfall, but it wasn’t possible. There were some very nice cascades above the waterfall, however. So we started hiking back. Where Gum Gap and Raven Cliff Falls Trails intersect, we turned right to go to the overlook for the waterfall. The view here, however, isn’t very good. The waterfall is quite far away and the view is mostly obscured by foliage. If it wasn’t on the WC100 list, it probably wouldn’t be worth the time to visit. But now Sandy had completed the challenge. We took a picture or two and then headed back. Back at the car, we drove back into North Carolina through Brevard and got on I-40 east. Since it wasn’t too late, we decided to hit one more waterfall on the way. We got off the interstate at exit 112 and headed into Valdese to McGalliard Falls Park. It was just a short walk to the top of the falls where an old grist mill and water wheel are located. We had to go past the mill and take a steep path to the creek and then rock-hop back up to get to the base for some pictures. For being in a city park, it’s a rather nice waterfall. We got some pictures of the waterfall and the old mill then headed back up. It was a just a short drive into Morganton for dinner at Las Salsas, then made our way home.